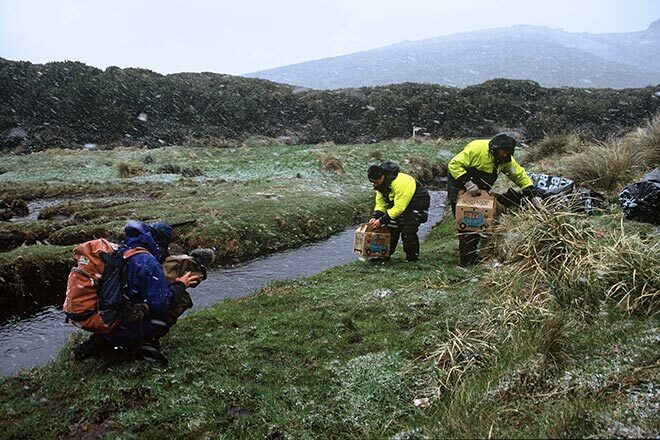 These boxes contain Campbell Island teal which are about to be released on Campbell Island – returning a species that disappeared there after rats invaded from visiting ships nearly 200 years earlier. From a tiny population discovered on nearby Dent Island, teal were bred in captivity on the mainland and on Codfish Island. In 2003 a rat eradication operation was completed on Campbell Island, making it safe again for the birds. Between 2004 and 2006, 159 teal were released there.